What would you say is the most interesting thing you learned about your character was? What would you say your favourite track is? After the ‘Guardians Of The Galaxy’ soundtrack follow-up ‘Awesome Mix Volume 2‘ was unveiled, the film will hit cinemas on Friday 28 April. 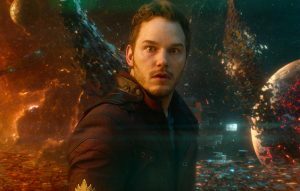 The post Chris Pratt discusses ‘Guardians Of The Galaxy Vol. 2’ and the ‘awesome’ soundtrack appeared first on NME.